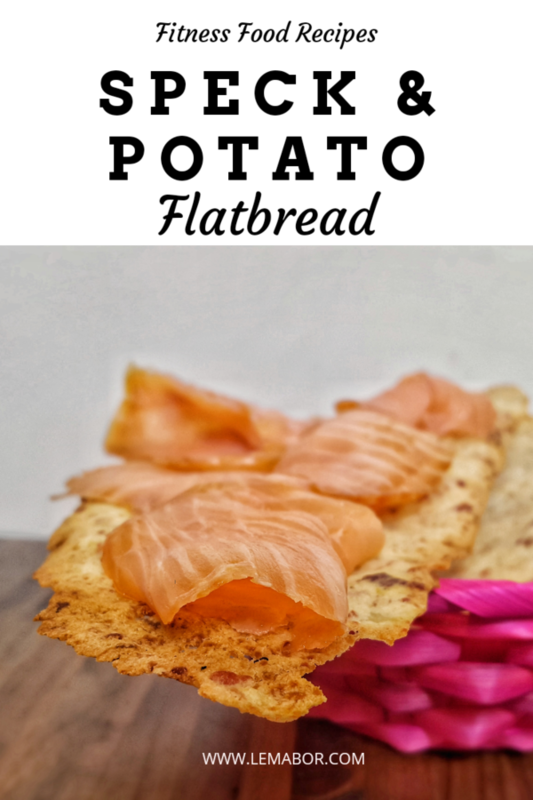 When you need to cut down on bread, this crispy potato flatbread has that crunchiness and taste you’re after. 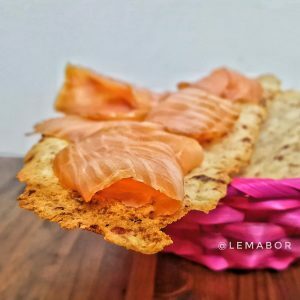 This time I found a solution to replace the corn cakes and all the various wasa crispbreads. I got fed up of eating them over and over. 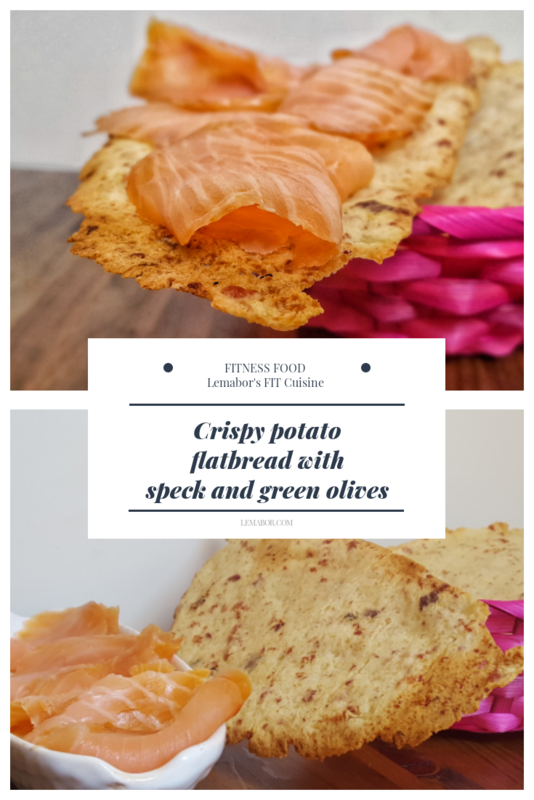 I thought outside the box and came out with these thin crispy flatbreads, fitness food style. They’re great for a snack on-the-go. I toss them in a ziplock, crush them a little and I got some crunchy chips ready to dip in a jar full of skyr or Greek yogurt. Amazing pre-workout snack. I need variety, new discoveries and flavours, often spicy ones, it’s no accident I chose speck for this flatbread. Speck is an Italian dry-cured ham, a specialty from Alto Adige. Speck is obtained from slightly salted, flavoured, and finally smoked pork thighs. The friability of this flatbread impressed me. I didn’t think the rice flour and the potatoes could absorb so much and make the dough so easily malleable. Life is a new discovery every day, it’s what makes life great. Knowing that the next day, however it turns out, you have learned something more than the day before, if you think about it, from the smallest things to the biggest ones, we are constantly evolving … and I find it fantastic. Just pay attention and you’ll notice too. But back to the recipe, I often use potatoes, even in the last post for tuna tots they were the main ingredient. It’s not like I’m fond of them, is it? Ok, yes I am . They fill me up without overloading my stomach, I find them to be an excellent source of carbohydrates. 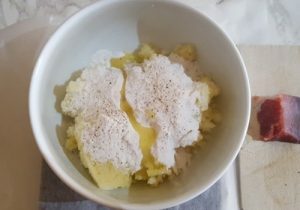 To make this recipe I spent a total of € 1.60 and a portion € 0.80. It’s a low-cost food indeed. Product availability: everything can be found easily at the supermarket. As said if you can’t find speck replace it with another type of smoked or dry ham. They are very simple to make, but pay attention when spreading out the dough, if it’s too thin it’ll burns, if it’s too thick it won’t get crispy. A few millimeters is fine. for 10 minutes and then mash them. 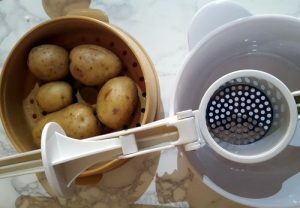 Or peel, chop and boil them for 10 minutes and then use the potato masher. Both work, so just choose which you prefer. 2.Add the rice flour and then pour the water in and while mixing well. 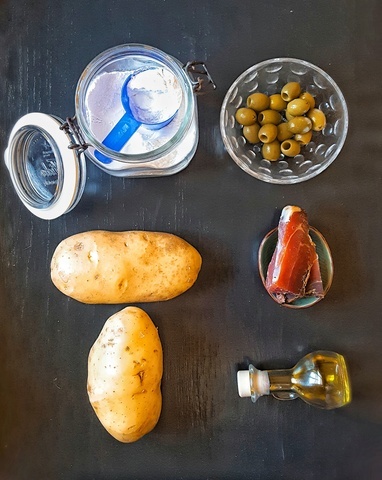 3.Blend the olives and the speck and add them to the mixture combining everything homogeneously. a couple of spoons are enough. 5. Cover with another sheet of baking paper and crush with a rolling pin to make them a few millimeters thick. Remove the cover sheet.I prefer not to make a single thin sheet, but making 3-4 single ones. They cook better and get crispier. 6.Bake at 180°- 200°C for 20-25 minutes checking that it does not burn, especially if it’s very thin. Let it cool down to increase the crunchiness. 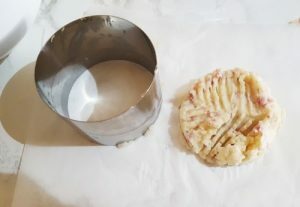 I Use 2 methods for potatoes: I steam them whole without peeling them (just don't pick the biggest,I mean normal potatoes) for 10 minutes and then mash them.Or peel, chop and boil them for 10 minutes and then use the potato masher. Both work so just choosewhich you prefer. Add the rice flour and then pour the water in and while mixing well. 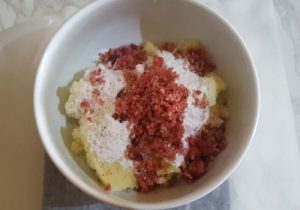 Blend the olives and the speck and add them to the mixture combining everything homogeneously. 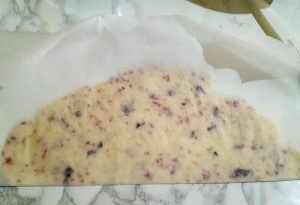 Line the oven tray with baking paper. With a dough cutter, adjust the amount, usually a couple of spoons are enough. Cover with another sheet of baking paper and crush with a rolling pin to make them a few millimeters thick. Then remove the cover sheet. I prefer not to make a single thin sheet, but making 3-4 single ones. They cook better and get crispier. Bake at 180C°- 200C° for 20-25 minutes checking that it does not burn, especially if it's very thin. Let it cool down to increase the crunchiness.